An ex-Guantanamo Bay inmate who returned to command pro-Taliban militants in Pakistan died Tuesday when he blew himself up with a grenade to avoid arrest, police said. The demise of Abdullah Mehsud is a boost to the government, which faces growing U.S. pressure to crack down on Islamic militants battling security forces near the Afghan frontier. A senior Pakistani security official tells CBS News on condition of anonymity, "Abdullah Mehsud was encircled and our forces were closing in on him. Suddenly there was an explosion in which he was killed." CBS News' Farhan Bokhari reports that Mehsud's death marks a significant symbolic setback to the Taliban forces who have regrouped along that border in the last 18 months. The security official tells CBS News Mehsud's death confirmed "the vulnerability of the Taliban leaders", but conceded his death "would not make a difference to the Taliban's ability to fight on." Intelligence agents cornered Mehsud at the home of an Islamist politician in Zhob, a town 160 miles from the southwestern city of Quetta, police officials said. 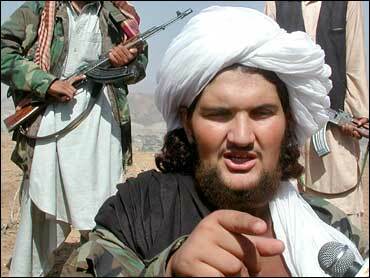 "My information is that Abdullah Mehsud killed himself," Zhob police chief Atta Mohammed told The Associated Press. "Thanks be to God that only he was blown up and our men were safe." Federal Interior Ministry spokesman Javed Iqbal Cheema confirmed Mehsud's death, but provided no details. One of the Chinese, who had been working on a dam project, was killed while the other was rescued alive in an operation by Pakistani commandos. A Pakistani intelligence official said Mehsud was intercepted on his way back from Afghanistan's Helmand province, where the official said he led supporters fighting alongside the Taliban against Afghan and U.S. forces. The intelligence official, who is not authorized to speak on the record to reporters, said Mehsud had been in Afghanistan for more than a year and that there was no evidence that he organized the recent violence in Pakistan. Western diplomats tell Bokhari Mehsud's death comes as Pakistan's U.S.-backed military leader, President Gen. Pervez Musharraf appears more determined to demonstrate his willingness to attack militant targets near the border with Afghanistan. Since Saturday, Pakistani troops have killed at least 35 pro-Taliban militants in a series of incursions near the border. Pakistani officials were alarmed last week over a new U.S. national intelligence report which suggested al Qaeda's presence had grown in Pakistan's tribal regions — semi-autonomous territories along the Afghan border ruled largely by local tribal leaders according to decades of custom. "The Pakistanis certainly seem to be trying to demonstrate that they are actively cleaning up the tribal area," said one senior Western diplomat, who spoke to CBS News on the condition that he would not be named. "The Pakistanis probably feel, if they don't clear up their own back yard, the U.S. (forces) in Afghanistan may cross the border to clean up the mess." Officials said the house in Zhob, where three other men were arrested, belonged to Sheikh Mohammed Ayub and that he was not at home at the time. Abdul Ghafoor Haideri, a federal lawmaker for the Jamiat Ulema-e-Islam, said Ayub had been expelled from the pro-Taliban party about four months earlier for "suspicious activities and violating party discipline." He declined to elaborate. Before dawn Tuesday, militants launched fresh attacks on Pakistani troops stationed at roadside security posts in North Waziristan, an intelligence official said. Troops returned fire, triggering gunfights. No casualties were reported, the official said on condition of anonymity because he was not authorized to make media comments. Militants detonated dynamite at a municipal office late Monday in Miran Shah, the regional capital in North Waziristan, causing damage but no injuries, he said. Further north, the beheaded bodies of two soldiers abducted the night before were found Tuesday morning in the Bajur tribal area, said Sardar Yousaf, a local government official. A note found in the hand of one of the slain men said that spies for President Bush or Musharraf would meet the same fate, Yousaf said. Violence has flared across Pakistan since a deadly military raid on a radical mosque in the capital Islamabad earlier this month. More than 300 people have died, most of them security forces. Most of the violence has been in North Waziristan, a tribal region where a 10-month-old peace deal with between the government and militants has broken down and the army has redeployed troops backed by helicopters and artillery. Officials are trying to resurrect the deal, signed in September by tribal elders who pledged to expel foreign militants and stop cross-border raids into Afghanistan. However, Washington has described the accord as a failure which afforded al Qaeda breathing-room to regroup — and perhaps plot another big attack on the United States. Arab, Afghan and Central Asian militants suspected of links with al Qaeda as well as Taliban and local militants operate in North and South Waziristan. The area is viewed as a possible hiding place for al Qaeda chiefs Osama bin Laden and Ayman al-Zawahri. The government has angrily rejected suggestions from U.S. officials that American troops might conduct cross-border raids from Afghanistan on al Qaeda hideouts in the tribal belt along the frontier.